One of the most enjoyable times in our work is when we bring out drums for a drum circle. We experience some amazing things in this dementia work. One of the very best experiences is when we incorporate music into our work. People who may never speak, or have trouble finding common words can still often sing and remember all of the words to favorite songs or hymns. The voices may not be strong as they were years ago. There may be more quavering notes but the love of singing is still strong in so many of our elders. Their generation was one that sang a lot, whether in church or synagogue, in school chorus, or just singing together with friends on the street corner, this was a singing generation! Sadly, younger generations have lost this feeling for the song. We don’t tend to come together to sing as much as our elders did. They understood the strong bonds and the joy that group singing can bring. They have never forgotten this experience, nor have they forgotten the songs. These songs uplifted and unified this older generation in a way that nothing else really could. This music can still uplift and unify them today. These are people who may not remember the names of their family members. They may not be able to name simple objects like a table or a toothbrush, but they remember every word to their favorite songs. There is just something in music that lights up the brain, something that calls forth memory. Music is a direct route to reach people living with Alzheimer’s. People who were able to play a musical instrument in their earlier lives can usually still play that instrument when they are living with Alzheimer’s. They may be rusty, they may have lost much of their proficiency with the instrument, but they can often still play. If given the opportunity, people with Alzheimer’s can practice on their instrument and they can get better! We know because we have seen it happen. Dom had been a pianist and choral teacher all of his adult life. When we met him, he had been living with Alzheimer’s for many years. Living in a locked dementia unit, Dom became withdrawn, belligerent and difficult to deal with. However, when he sat down at the piano in the gathering room of the long term care facility, he could play tunes from memory for hours! He was a wonderful musician who played with flourishes, panache and with great joy. His whole face would light up and he would become lost in the music. People would spontaneously gather around the piano and join in singing as Dom played. There was just one little blip in this magical musical recital of Dom’s. Somewhere in every song, he would insert a phrase or two of the tune, Listen to the Mockingbird and he would whistle along to the snatches of this song. Dom could be in the middle of a fabulous rendition of the Hallelujah Chorus, or building to the end of My Country Tis of Thee and then, suddenly, up would pop the song, Listen to the Mockingbird with Dom whistling away. The singers that usually joined Dom in his impromptu concerts were amazingly tolerant of this little musical quirk of his. They would either try to sing a couple of lines from Listen to the Mockingbird, or they would patiently wait for the whistling to die away and for Dom to return to the original song. He always would return to the song, and to our astonishment, he would pick up the tune right where he left off before it was interrupted by his signature tune and his whistling. Dom was a happy man when he sat down to play the piano. That was the only time we ever saw him be gregarious, relaxed and happy. Music was the only thing that ever seemed to reach him. Through the music, Dom gave himself and many others hours of unadulterated joy. One of the most enjoyable times in our work is when we bring out drums for a drum circle. We meet people who tell us that can’t play drums because they don’t have any rhythm. We tell them that if they have a heart beat, then they have rhythm in their bodies. The remarkable thing about the drum experience is that, after a short time, the group begins hitting the drum at the same time, using the same beat. They usually begin in a sort of chaos of sound, and then, gradually, they find a common beat and they all begin to hit the drum at the same time together. We were stunned the first time we saw this happen. People were actually listening to each other and then began playing with each other. It is a wonderful bonding experience. We see all sorts of drummers in our Alzheimer’s drum circles. 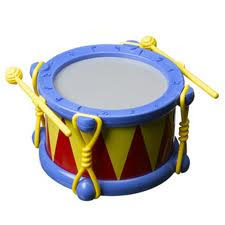 Some people use the drum as a means to release stress or anger. We see them beating the drum with all of their might, their mouths pursed tightly. After a time, these angry drummers begin to calm down, and to join in the rhythm of the circle. Their tight faces relax and the grimaces are replaced with smiles. We also see the shy drummers, people who tentatively and softly hit their drums. After a time, these shy drummers gradually lose their inhibitions and sometimes we see them wailing away on their drums, tapping their toes, completely absorbed in the rhythm surrounding them. There are many kinds of drummers in our drum circles, but, over time, everyone experiences their own happiness and a true bonding with others in the circle. Much of the fog and confusion of Alzheimer’s starts to fall away in these drum circles and we see the joy of life come shining through the faces of the drummers. For people who struggle with language, or who can no longer use language, drum circles are a wonderful way to express those emotions that they can no longer express through words. Music gives people with Alzheimer’s the chance to release pent up emotions, to share their feelings with a group, to find support from the circle of singers and drummers. There is an old proverb that says, God is happy when we work together, but he loves us best when we sing together. All of us, those with Alzheimer’s and those of us who love them, all of us can come together and make one heck of a joyful noise! Tom and Karen Brenner train family members, professional caregivers and medical staff in the use of cutting edge interventions for persons who have dementia and Alzheimer’s. The Brenners use the Montessori Method as the foundation for their evidence based memory support program. This program uses the five senses, muscle memory, and spiritual engagement to maintain connections for persons with memory loss. 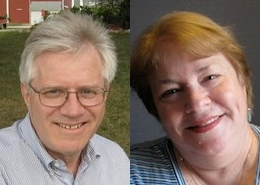 Tom and Karen are the authors of You Say Goodbye and We Say Hello: The Montessori Method for Positive Dementia Care.